May 29th in Free Themes by Wordpress Jedi . Those of you who have been paying attention to the top sites on the Internet have probably had a chance to see RSS aggregator sites such as AllTop. These sites grab RSS feeds from the top sites on the Internet and organize them for their users. While you may not have the resources to set up a comprehensive RSS tracking portal like Alltop, you can take advantage of Transmit theme to create a small, personal one for yourself and your community. 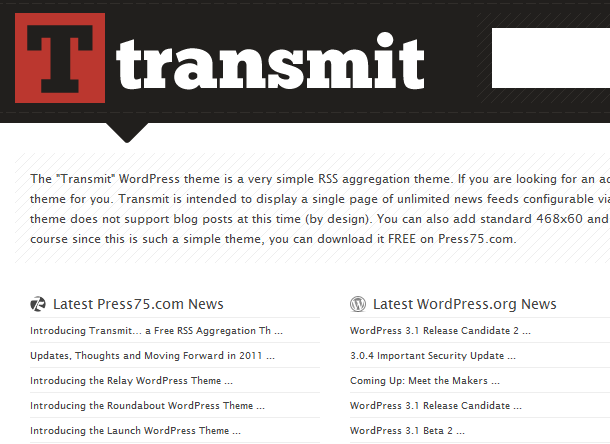 March 9th in Free Themes, Premium Themes by Wordpress Jedi . 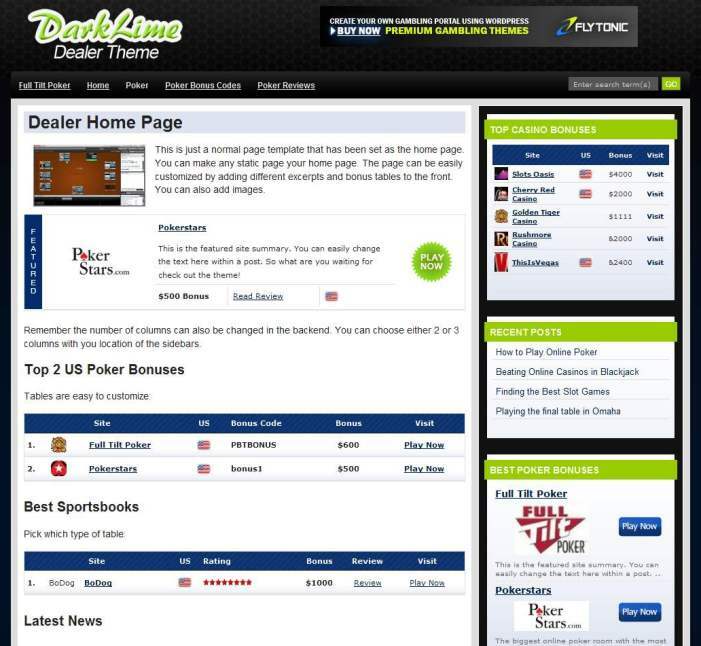 Dark Lime Dealer Theme: a gambling theme designed specifically for those of you who are affiliates of top Poker companies. It has an attractive design and cool widgets to get you started with your portal fast. 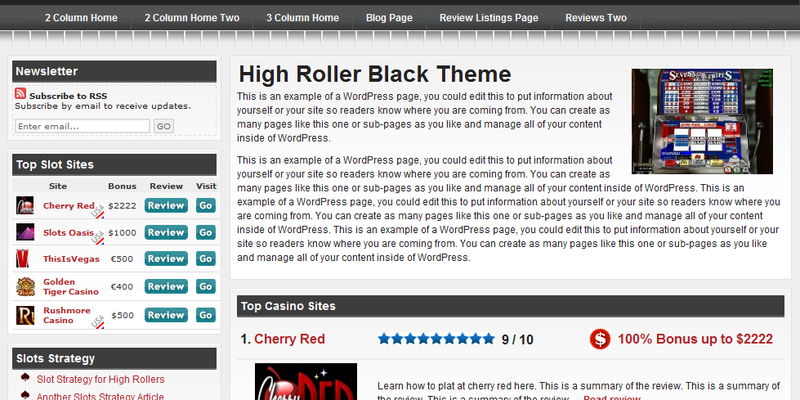 High Roller: another decent looking affiliate Poker theme for WordPress. 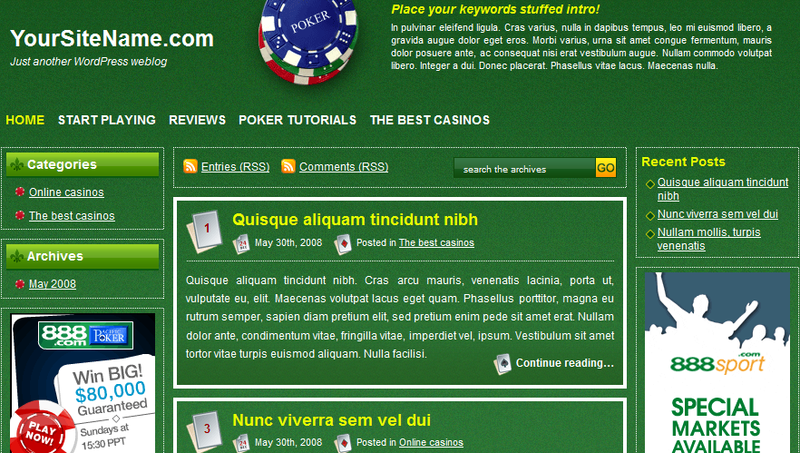 Lets you add and compare multiple Casino sites on your website. December 16th in Free Themes, Social Media by Wordpress Jedi . So you have been working hard to build a large following on Twitter? Maybe you have an established blog and want to use it to build your followers up on Twitter. Whatever the case, TwitterCounter is your best friend. TwitterCounter is a cool service that lets you promote your Twitter profile on your blog or portal and encourage others to join you and the community on Twitter. TwitterCounter will display your number of followers on your Twitter blogs and comes with a set of cool badges that you can use as the starting place to promote your profile. 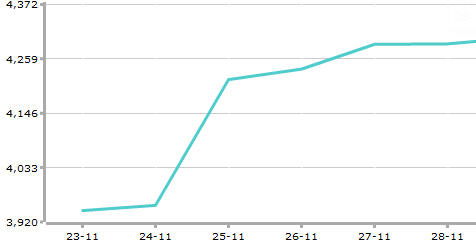 The service will also show your progress over time, so you’ll know when you are not on the right track. July 23rd in Clone Wordpress Themes, Free Themes by Wordpress Jedi . Twitter is one of the top social networking sites on the web. Anybody who’s been involved with blogging for a while has heard and tried Twitter before. It’s truly a great place to meet new people, find new ideas, and develop new connections and businesses. 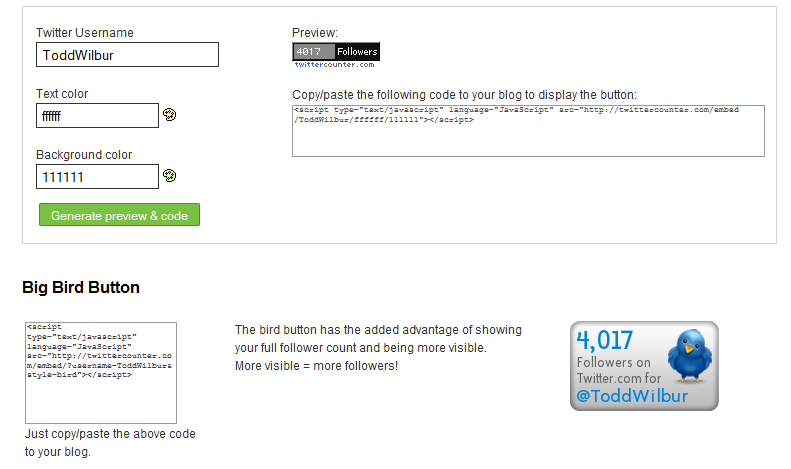 And now thanks to Fresh Tweet, you can duplicate the look and feel of Twitter on your WordPress blog. Fresh Tweet is a Twitter clone WordPress theme that is easy to install and helps you show your love for Twitter and what it stands for. Fresh Tweet is not only lightweight but easily customizable. Once you install Fresh Tweet, you are going to see the similarities that it has to Twitter. But of course you’ll have your blog posts instead of tweets. Just like Twitter, you get one sidebar, on the right side of your screen. You can use it to push your ads on and monetize your blog. You can also change the look and feel of the theme so easily as the code is not particularly complicated. Your posts pages are not too complicated either. You can easily add your images and social media icons to the end of each post without too much trouble. You can also customize your logo and other aspects of your theme fast. What I like about this theme is that it gives you the ability to create a socialize page that lets you readers get involved and leave you their thoughts and questions (just like Twitter). 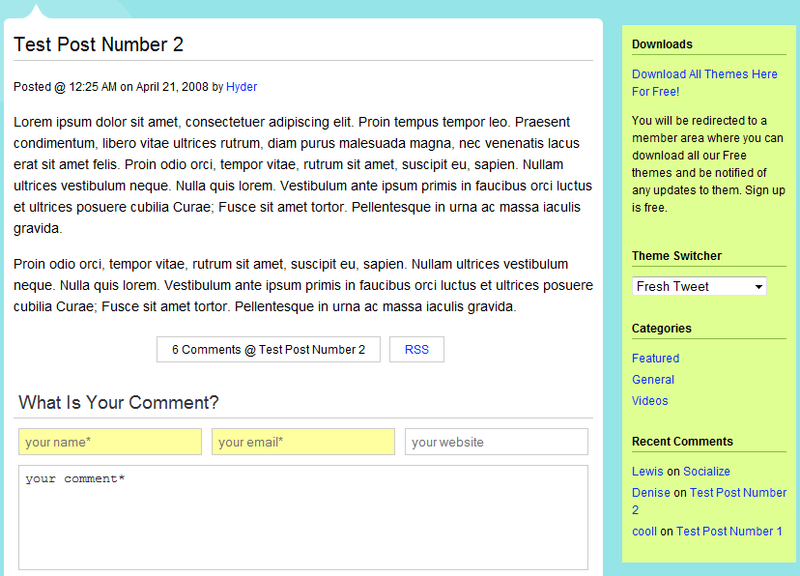 All in all, Fresh Tweet is the unofficial Twitter WordPress Theme. It’s well-designed and lightweight and gets the job done. 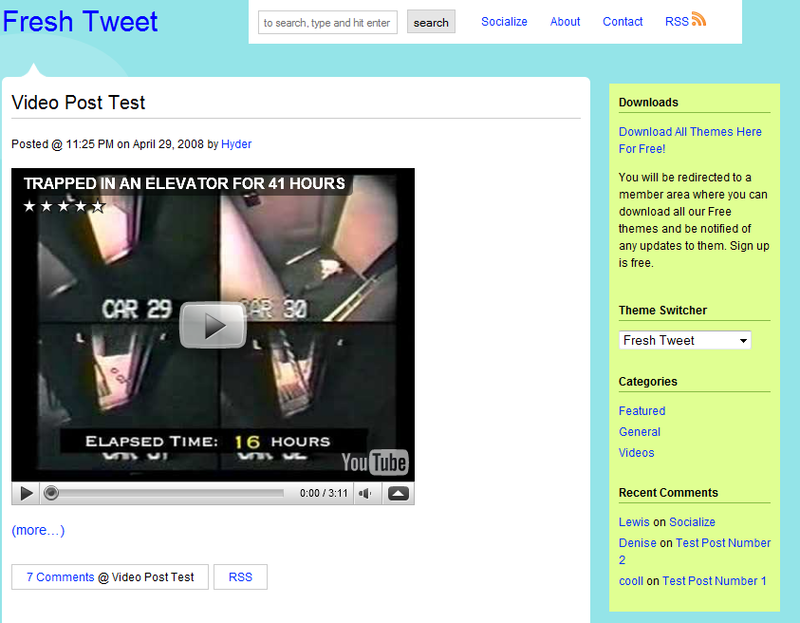 If you are a Twitter junkie, you are going to love Fresh Tweet (it’s free too). May 31st in Free Themes by Wordpress Jedi . This theme uses custom fields to help you integrate YouTube and thumbnails into your blog easily. Flickr integration is done via FlickrRSS. Overall, if you are looking to duplicate the look and feel of Digg on your blog, you should consider trying this free theme out. It comes closest to Digg’s design than any other theme I have seen on the market. May 23rd in Free Themes by Wordpress Jedi . Facebook is one of the hottest properties on the Internet these days. Millions of people use it to communicate with their friends and colleagues and connect with others online. But what if you are not in love with Facebook but want to clone its design on your WordPress blog? That’s exactly what you can do with Crybook theme. It’s an amazingly identical clone of Facebook that lets you start your very own blog with the look and feel of Facebook. Furthermore, it’s so flexible you can go beyond what’s offered on Facebook to make your blog look unique to your visitors. CryBaby also allows you to change the color and look and feel of the website fast. You can choose your favorite color by taking advantage of the color picker feature at the top right side of your theme. You get 5 colors to choose from. The logo can be easily changed as well. The theme also supports threaded comments and has an integrated feed counter to help you keep track of your subscribers easily. The custom admin panel is easy to use as well, and you can also manage your AdSense and analytics codes easily on this theme. Overall, if you are looking for a free, SEO-friendly theme that looks awfully close to Facebook, you ought to give CryBaby a try. It’s the cheapest way to clone Facebook!